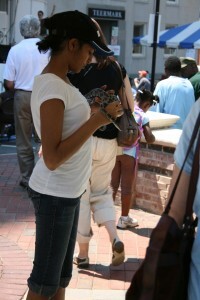 On Saturday, April 25th, Durham held an Earth Day Festival in and around the CCB Plaza downtown. I went in part to get some sun, in part to see what an Earth Day Festival would entail and in part to explore downtown’s architecture and history a little more with the aid of my trusty guidebook, Walking Raleigh/Durham by Rebecca Mann. As to the festival, it was larger than I expected with lots of booths full of information about recycling, solar panels, preservation of local wildlife systems, energy efficiency, and crafts made from recycled materials. Oh, and snakes. There were performances and talks taking place on two separate stages as well as skateboarding demonstrations as Durham’s skateboarding park broke ground that day. After milling through the booths for awhile, I decided to go ahead and take my walk around a few city blocks of downtown, starting with the Bull. And I am glad that I did! I am not someone who automatically notices cool architecture or knows the history of a building offhand, so I love to walk around, guidebook in hand, and learn something new. 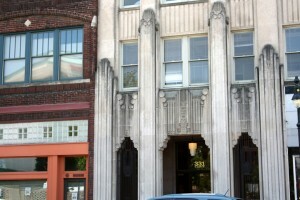 There are tons of awesome buildings in Durham and I just never knew it! 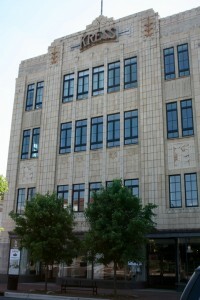 Okay, I knew a few already, like the Carolina Theater and the Durham Armory but I did not realize how awesome the Snow Building is, rocking its art deco front. Or how totally cool the Kress Building is, either. Heck, I never knew it said Kress on top. Obviously, I don’t know how to look up when walking around downtown areas. Lastly, I’ll leave you with this picture of a sight not likely to be seen again, as local treasure, Paperhand Puppet Intervention is not always on hand to lend some mood to a storefront. As to my first goal of getting sun, rest assured, I had plenty and my tan lines were happy. The afternoon ended with a cherry Locopop that felt oh-so-delightful on my tongue. 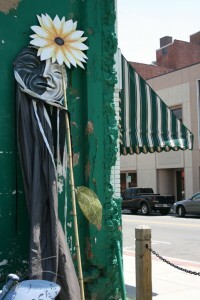 If you’d like more pictures of downtown Durham on Earth Day, check my photo website here. There are pictures of the skateboarding, too. These are great photos! 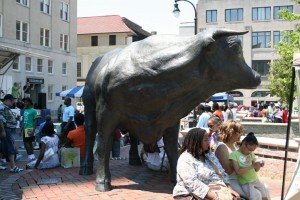 I didn’t know there were Earth Day festivities in Durham. I will definitely need to go next year!